Cuba has a long history of World and Olympic boxing champions, both in professional (banned in 1962) and amateur boxing. Perhaps it was the great Cuban boxing idol of all time, Eligio Sardiñas, aka Kid Chocolate, who triggered that dream forever. In the 1940s, Kid once said, “I am boxing.” And many of his fellow countrymen could say the same thing today. This black sportsman, who became Cuba’s first world professional boxing champ, was then declared the country’s best boxer. And in New York, he was acknowledged as the best dressed man of his time. 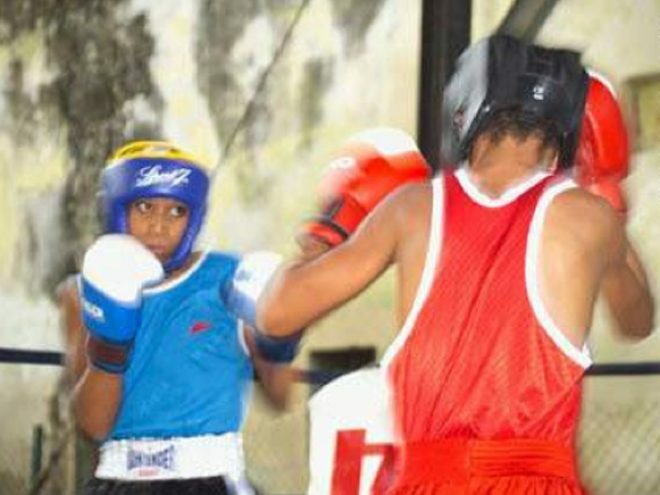 Cuban children today begin to box at 8 or 10 years of age. Possibly, many of those who get into the ring for the first time evoke the figure of a slender boxer, who seemed to dance in the ring. Like a great stylist, it was very difficult to even touch his face thanks to the way he dodged punches dancing left to right, up and down. That was the image that stuck with his fans. In past decades, a new hero in amateur boxing came on the scene—Teófilo Stevenson. Nobody could defeat him. He would finish his opponent in the first assault, usually by KO. He won all the Olympics and world championships in which he took part. Several years later, Felix Savón, another star boxer, also fascinated the crowds. Cuba is the only country that can boast of two three-time Olympic Champions—Stevenson and Savón. In Cuba, would-be fighters start to train at an early age. There’s no time to lose—there are many competitors in an island filled with boxers. If you don’t start to train at an early age, you’ll never get to be a champ. Also, Cubans are famous for their skills in all combat sports. A chain of gyms throughout the country give young boys the chance to practice boxing under all requisite rules and regulations as well as safety measures. “Sport is the right of the people” is the slogan of the National Institute of Sport, Physical Education and Recreation (INDER). Cuban authorities have spent 50 years giving special attention to sport, which is practiced on a large scale throughout the Cuban territory. Children with a talent for sports train at vocational schools and at the same time complete their general primary and secondary education. Athletes with a high level of achievement are sponsored by the State and dedicate themselves full-time to training. The island ranks among the best in over ten different sports. Boxing, along with baseball, reign in the small Caribbean nation. There is no professionalism, so the State gives all its support to sport. It is estimated that several thousand boys, from 8 to their mid-teens, practice boxing under trained coaches. They do this with protective helmets, insofar as the material resources available allow. Blacks and mestizos predominate, perhaps because they are faster and of their usually more powerful physique. All of these kids have one dream: to become today’s Kid Chocolate or Teófilo Stevenson; win an Olympic medal and the acclaim of sports fans. It’s not so impossible to become a champ. Cubans have won around 30 gold medals in Olympic Games in boxing alone, not to mention the medals won in wrestling, judo, track and field, weightlifting, volleyball, baseball and others. Whether newcomers to the sport or the most experienced, boxers always receive the enthusiastic support of the millions of fans in Cuba.